The VTI 90 Series Horizontal Filling Machines are the industry leader for filling liquid and semi-liquid products with particulates. VTI starts with an innovative product pathway that allows VTI 90 Series Machines to fill and deposit your products at higher speeds, with more accuracy and with less product degradation than other competitive fillers. PIE LINES Servo PD Pump Fillers are great for pie fillings such as small berry, pecan and pumpkin and any other fillings with small particulates. Dough sheet lines: Our PD Pump Fillers great for spot depositing various products onto dough sheet lines. They are great for making items like turnovers, and strudels. 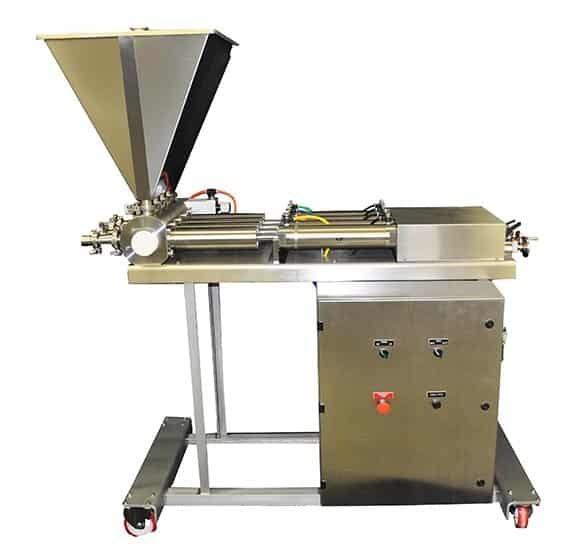 Everything from apple filling, chocolate filling, cherry and mixed berry fillings can be deposited quickly and cleanly onto your dough sheet line. CUP MACHINE APPLICATIONS Our Servo Positive Displacement Pump Fillers / Depositors are great for depositing your liquid or slurry products into your cups or tubs. Everything from stews, soups, BBQ sauces, apple sauce, caramel sauce, are prime applications for our Servo PD Pump Depositors. We can fill your products onto your containers quickly and cleanly every time. SERVO FILLER CONTROLS All Servo Positive Displacement Pump Fillers come equipped with a Solid state PLC controller, servo drives, and a color operator interface. Each control system offers the operators menu driven control functions. All filling systems can easily be configured to optimally fill or deposit your products into any style containers. All of the filling functions are adjustable via a menu driven operator interface. Our Servo Positive Displacement Pump Fillers / Depositors are great for depositing your liquid or slurry products into your cups or tubs. Everything from stews, soups, BBQ sauces, apple sauce, caramel sauce, are prime applications for our Servo PD Pump Depositors. We can fill your products onto your containers quickly and cleanly every time. All Servo Positive Displacement Pump Fillers come equipped with a Solid state PLC controller, servo drives, and a color operator interface. Each control system offers the operators menu driven control functions. All filling systems can easily be configured to optimally fill or deposit your products into any style containers. All of the filling functions are adjustable via a menu driven operator interface.